The Leyland Cypress tree is great if you need to create privacy for your home. It's a fast growing tree with a growing around 2-3 feet per year. We recommend planting them in a line with about 5 feet apart from each other to create quick privacy. When planting alone the tree looks like Christmas tree. The Leyland Cypress is a hybrid between the Alaskan Cypress and the Monterey Cypress. The hybrid cross occured in 1888 and has been used in landscaping ever since discovered. 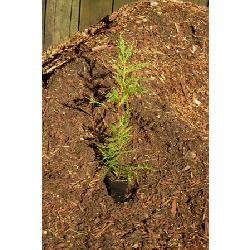 Leyland Cypress are very hardy plants and easy to care for requiring simple maintenence. They are also known to be drought tolerant. We ship your Leyland Cypress trees with care and in their original pots. We line a box with paper, making sure they are properly watered, pack them tight to prevent too much shaking and send them via UPS. Recommended Zone	6, 7, 8, 9, 10 Scientific Name	Cupressocyparis leylandii 'leighton green' Mature Height (ft)	40 Feet. Mature Width (ft)	8 Feet. Growth Rate	2-5 Feet Per Year. Spacing	5 Feet Fertilizer	14-7-7 Slow or controlled release. Light	Partial to Full Sun light.